If there is something similar between the Roman Empire and United States of America that has been the most powerful country in the world in recent history has always been that proud feeling, a constant effort to preserve, exalt its virtues and achievements in such a way that sometimes seem far-fetched. Roman Empire had good, bad and silly emperors. Similarly, we have seen good, bad and silly US presidents. Still, one of the strangest cases not only in Roman Empire but in human history as well may be equal to what has happened to Donald Trump recently. Didius Julianus bought Roman Empire after the death of Pertinax who was assassinated by his Praetorian Guards because he did not fulfill his promised monetary demands. All of a sudden, Roman Empire was opened to public auction and Didius Julianus bought it showing off his extraordinary wealth, trying to impress the high society of his epoch in a both unbelievable and clumsy chapter of Western history. His wife and daughter encouraged him to do so, Didius Julianus stood up and he offered 25 thousands sesterces to every soldier that were accepted by the Praetorian Guards. Everybody praised him. Who wouldn´t? He was the new Roman Emperor. 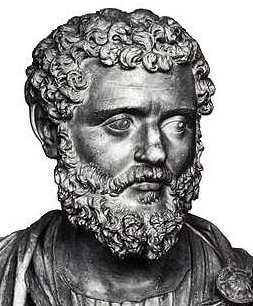 Soon thereafter and once the party ended Didius Julianus saw everything from a fearful point of view. He realised he did not have a single clue on how to rule Roman Empire, something he had never prepared for. How was he going to lead an army with no military knowledge? Why Didius Julianus made a bid for the Empire in the first place anyway? He could have maintained a millionaire Roman lifestyle. Two months after buying Roman Empire, Didius Julianus was assassinated by his guards and an experienced general was crowned new Roman Emperor. Roman Empire no longer was as great as it was before. Last words of Didius Julianus prior to be killed were these "What Have I done wrong??" Comparison to Donald Trump and United States of America could not be (in my opinion) better. Why does Donald Trump abandon his funny celebrity profile who was in every party, on every show? Why at 70 years of age he does not focus his efforts on his fifth son of only 10 years of age and enjoys life with his young third wife, his children and his multiple businesses?. Does Donald Didius Julianus Trump know where he is really heading to??? There is a theatrical play in which an elected politician spends two hours saying preposterous things and acting like a clown whereas the audience laughs continuosly. At the end, the politician gets serious and addresses himself to the audience. "Why are all of you laughing? 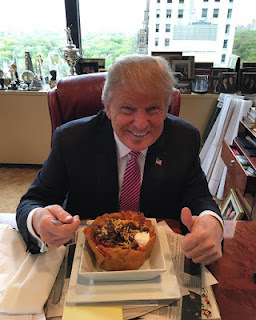 You have elected me, if you are laughing at me, you are making a fool of yourselves"
Eating Mexican food to "Make Hispanics feel safe again"
Ah history. Those who read it see it told, over and over again. Those who do not read it, are doomed to repeat it, each time as new. 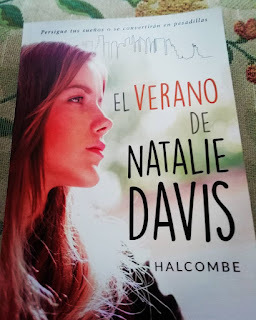 Enjoyed reading it. Thank you for expanding my knowledge. I really liked this post! Interesting read! My wife and I have often said this election (and subsequent results) were reminiscent of the Roman Empire. Thanks a lot for commenting. History shows us that the ones who made Didius Julianus to buy Roman Empire were his daughter and wife so that impress everybody. It is funny to discover the daughter and wife of Donald Trump are former fashion models, a world where appearance is everything. What is more, the husband of the daughter, Ivanka, has been hired to work alongside Trump in Washington. However, it has been assured Donald Trump has been dreaming with being president since 1980s and all his tv appearances since then were aimed at gaining popularity and notoriety. I don't wish violence on anyone, but it would not surprise me if Trump resigned or was impeached before he completes his 4-year term. It would, however, surprise me greatly if he won a second term!